. @yorkiebea Thank you so much for joining us this morning, it was an absolute pleasure to welcome you to Crosfields. Amelia Saunders was just four when she succumbed to the inoperable tumour in 2013. The Talbot Memorial Garden has been created at Crosfields School, in Shinfield Road, where Amelia was a pupil. It is a legacy to the eponymous first chairman of governors at the school. A cherry tree was also planted in the garden in memory of Amelia, after which more than 500 pupils gathered to hear a speech by the Princess. Amelia’s parents attended the gathering, which also heard songs from several choirs at the school. Princess Beatrice was back in London on Friday after enjoying a trip to Florence for a fashion conference. But it seems fashion was still on her mind as she was spotted in Mayfair on a shopping trip and carrying a bag from Karl Lagerfeld's London store. Her bodyguard carried a few more of her purchases as she held onto a coffee. Friday May 24 2015,Along with opening The Talbot Memorial Garden Princess Beatrice also attended a Humanitas Charity fundraiser at Malletts of Mayfair London. yes ... Beatrice is choosing this path. The question of appearance or not the son of Diana. No more excuses. sorry,but .... is time past. Just look at the love and respect that the public has with ZARA. Zara couldn't hold a Title as she is the daughter of a female who can't pass on her Title to her children ... weird reason to respect her for if you ask me ... doesn't she live at mommy's ? Princess Beatrice did a rare “royal work” public event yesterday. She officially opened a new classroom at the Maple Hayes dyslexia school in Lichfield. Dyslexia is a cause close to Beatrice’s heart – she is dyslexic, and she’s been an advocate/patron with a dyslexia charity for a while. I always wonder about the timing of some of these events – like, did Beatric want to do this opening specially on this day because she thought it would unlikely that Duchess Kate would steal her thunder? On this particular instance, I doubt it. There’s no way Beatrice would have known that the world would be still waitying for Kate to give birth. Unfortunately for Beatrice, this rare public event comes after months of criticism for her lay-about and vacation-happy existence. A few weeks ago, The Daily Mail went through their recent archives and figured out that Beatrice had gone on no fewer than 11 vacations in six months’ time, all while being unemployed. Team York freaked out at all of those reports too – Team York claims that Beatrice is being thrown under the bus for some kind of nefarious purpose. Of course, that hasn’t stopped her from going on a few more vacations. The appearance on Monday came after she returned to England after a jaunt to Florence, Italy. Princess Beatrice will no longer have to ask the Queen for permission when she decides to marry. The Succession to the Crown Act requires the six members of the royal family nearest in line to the throne to obtain the Queen's consent before marrying. But the new royal birth means that the Duke of York and Sarah Ferguson's eldest daughter Beatrice has moved from sixth to seventh in line to the throne and will not have to ask her grandmother's permission before getting married. The Act, which came into force in 2013, changed the law surrounding royal succession so that male members of the royal family no longer have precedence over female members. Team York - LOL. So she is going to NYC to work? How will she adjust - no vacations every other week! I totally agree with Danifaul - Bea has had lots of feedback about how her jet set lifestyle is not appreciated - yet she continues to do it. She had her chance with the Brit people and she blew it - some blame goes to her parents who have been such great role models but ultimately Bea made the choice. So now we'll see how long this NYC job lasts - or if it is even true. Looks like maybe the Yorks have gotten he message re: slimmed down monarchy but what will Andy do all on his own in the UK? Victory in Europe -Day One-Windsor Castle – MAY 08: Princess Beatrice attends the lighting of a beacon, by Queen Elizabeth II during three days of national commemorate. Along with the Duke of Edinburgh and the Duke Of York. The Queen lit the first of 200 beacons marking the 70th anniversary of Victory in Europe Day. Seems to me that bea is still asked to support the Queen, even though its on a few occasions, so that just mixed signals right there. 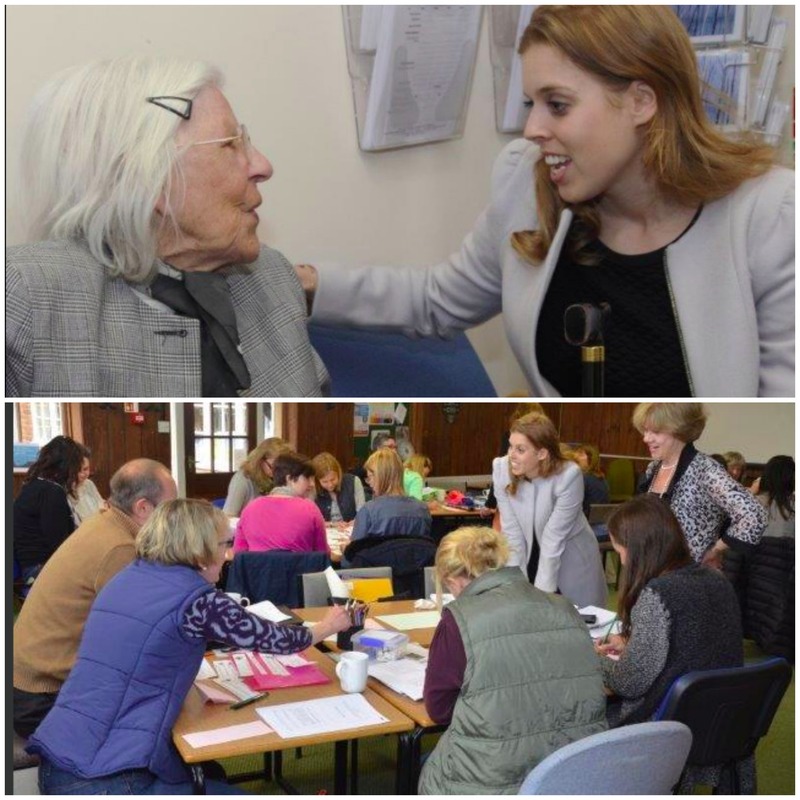 Early on March 8th before attending The Beacon Lighting Ceremony With The Queen Princess Beatrice made a surprise visit to one of her patronages The Helen Arkell Dyslexia Centre. Princess beatrice was photographed with the founder herself , Helen Arkell. ^Very rarely do I bash the Yorks but as a fundraiser this ticks me off. You don't 'surprise' a charity. That smacks so heavily of self-promotion and using the charity. They deserve advance planning which is fundamental to any PR that is used to help them put their directives in the best light possible. .^ hmmm looking back on the tweets theres no mention of a surprise visit just a visit my mistake. ^Then I take it back. Never mind!!! As my source explains: 'William isn't a huge fan of Dave. It's fair to say that if Beatrice had asked the Queen for permission to marry Dave, and she in turn asked William privately for his view, she may not have been given a glowing report. William doesn't like Dave??? Really!! But it's ok for Williams 'girlfriend' to treat his own cousin like she's not a royal family member and she herself act like she's a true blue blood. What a crock!! ^^ If it is true perhaps Willy hits back now. I read somewhere the Yorks don't like Waity. I do think Beatrice is stringing him along unfairly; it's been nine eyars and she's still dangling him, leeching off of his money and time and connection to Branson. I don't think Beatrice is acting admirably in how she's treating Dave, to be blunt. ^Not sure if it was you but this has been said before and I wonder how you got to that conclusion. People can't keep they're mouths shut so if he had proposed, regardless of Bea's answer, we would've known about it. Seems to me that they're using each other, Dave may have hung out in the same circle but I doubt he would've had the same social opportunities if he hadn't been with a Princess. Supposedly Beatrice warned Dave not to propose and now Beatrice can't really say that she isn't able to decide if she could or couldn't marry him. I do think he's eager to tie the knot and secure Branson's eternal largesse, but thing is, Beatrice is using him for his connection to Branson. ^ But she doesn't need Dave for that. Branson's a royal sycophant if there ever was one, why would Dave, a guy with no real connections be the deciding factor here?